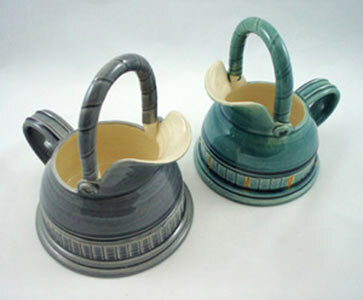 Sean has been designing and hand throwing his earthenware pots for almost 10 years! He started his career by studying a Degree in Ceramics at Cardiff. He then shared a studio with Mel Brown and this is where he developed his work and found his feet in the world of Ceramics! Sean now owns his own studio based in the Welsh Valleys. He was born and bred in the Welsh Valleys but due to the miners’ coal strike in the 1980’s Sean was raised in a time of social disruption. Sean reflects on these times: that his inspiration is derived from his fond memories of sitting around a warm coal fire surrounded by crafted tin ware and everyday functioning objects, hence why Sean’s work is reminiscent of old tin ware and coal scuttles. Sean’s choice of colours is vibrant and rich, a reflection of his fond memories.